Kyoto-style tofu, delicious as an addition to almost any recipe out there, and easy to digest. Package contains 440g (220g × 2 bags). 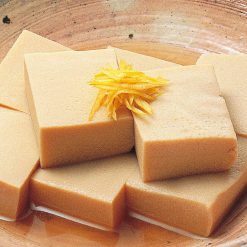 This frozen Seasoned Koya Tofu features a smooth texture that anyone will love. Originating from China, tofu was first brought to Japan during the 8th century. It became associated with Buddhist monks, and spread throughout Japan along with Buddhism. It’s now a staple of Japan, from street food, to traditional restaurants, to kitchens throughout the country. A well known nutritional powerhouse, tofu is relatively low calorie and rich in protein. In addition to various vitamins and minerals, it is an excellent source iron and calcium for any diet, being particularly helpful for vegetarians and vegans. *Coagulants used in commercial products include synthetic additives such as magnesium chloride and glucono delta lactone, etc. Our Seasoned Koya Tofu is already packed with flavor, and merely needs to be thawed and warmed up before being enjoyed. 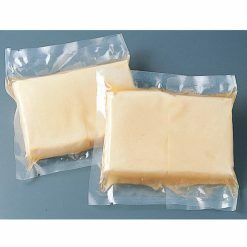 Remove the frozen tofu from the outer bag, place each inner bag in boiling water, and heat for approximately 15 minutes. After it has thawed, cut into bite-sized pieces and serve on a plate. This Seasoned Koya Tofu is delicious as is, thanks to the excellent seasoning, and its adaptive taste and smooth texture also makes it great as an addition to other dishes. Have fun experimenting with your favorite dishes, and some new recipes as well. This product contains frozen tofu [whole soybeans (China), crude seawater magnesium chloride (magnesium chloride)], sugar, soy sauce, salt, mirin, bonito extract, yeast extract, gelatin enzyme decomposer (includes raw wheat). This product is not suitable for anyone with allergies to wheat, soy or gelatin. Origin of ingredients: soybeans (China). Prepared and packaged in Japan.